Myopia (short-sightedness) is increasing globally, with prevalence of myopia doubling within the last 10 years in Europe and North America. It is estimated that 50% of young adults are shortsighted, compared to about a 25% of the general population. We offer a bespoke myopia control clinic to ensure we offer the best solution to help reduce the progression of myopia. 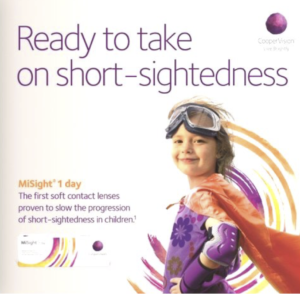 MiSight 1 day contact lenses are proven to reduce myopia in children by 59% on average. Whilst we can clearly identify the risks from increasing myopia, the question of how best it can be managed based on clinical and scientific evidence is less clear. Myopia cannot be reliably controlled, and it is difficult and too early to consolidate the various different research areas into a single clinical guideline. However, there are several evidence-based approaches that have been shown to potentially slow myopia progression. These are already widely used in East Asia. These are now making the transition from research areas to clinical practice treatment options in Europe and North America. However, the long-term efficacy of myopia treatment is not yet known, and several clinical trials are being conducted in different centres across the world which will inform clinical practice in the coming years. While a statistically significant reduction in myopia has been reported from studies, some people with myopia respond better to treatment than others and whether the reduction in progression could be valued as clinically significant is still unknown. There is also uncertainty as to what may happen if and when treatment is ceased, with some studies reporting a ‘rebound’ effect to higher levels of myopia at the end of the study intervention. Reynolds Opticians currently offer a myopia assessment and control clinic. We assess for the presence of myopia and then discuss the option available to you to help control myopia progression. Our first choice of myopia control is to use MiSight myopia control contact lenses. These contact lenses which been proven to reduce myopic progression by 59% on average in children. MiSight contact lenses are a special form of daily disposable contact lens suitable for children as young as 7-8 years old. They utilise clever ActivControl technology that allow children to see clearly while slowing their myopic progression and eyeball growth. MiSight contact lenses are easy to handle, comfortable to wear and are preferred to spectacles in 90% of children. MiSight contact lenses are no more complicated to fit than ordinary daily disposable contact lenses, and cost similar to a normal daily disposable lens. Orthokeratology (ortho-k) is a technique that provides quasi-emmetropic (normal) vision through the use of corneal moulding contact lenses worn by patients overnight. The lens design has the effect of flattening the cornea and shifts the wearer towards emmetropia, the benefits of which are retained for 24 – 48 hours after lens removal. Ortho-k has been shown to result in no significant side effects and is reversible. It has also been shown that fitting ortho-k lenses can slow the progression of myopia in school-age children (7), probably through a peripheral defocus mechanism in the same way as other types of lenses described above. It is also an effective treatment for adults who are unable to wear contact lenses or spectacles in the daytime (e.g. fire-fighters), but its effects on myopia progression in adults have not been shown. Parental history, ethnicity, environment (living indoors in cities) and undertaking near tasks have all been linked to the onset and progression of myopia. It has recently been shown that Caucasian children in the UK develop myopia at a younger age, with most developing the condition between the ages of 6-7 and 12-13 than during their teenage years (2). Myopia prevalence varies with ethnicity and is higher amongst some groups. Myopia is a risk factor for multiple ocular pathologies including glaucoma, cataract, retinal detachment and myopic maculopathy (3). Higher myopia leads to higher risk and even -1D myopes have a greater lifelong likelihood of developing eye disease.